Carrot, and Pea Flavour Filet Mignon Flavour Food For Small Dogs 3kg is rated 4.5 out of 5 by 49. Rated 4 out of 5 by TADON_367404067 from My little guy is unfortunately just like a child! He's so picky and fussy about his food that sometimes, he can go almost a whole day without eating because it's not the dog food he 'wants' to eat! As soon as I portioned out some from this Cesar sample, te dog food didn't stand a chance! My pomeranian-pekingese ate it without hesitation and time and time again, has licked his bowl CLEAN. I think it's safe to say that this will now be a staple in our household, so thank you Cesar for making my furry partner-in-crime so happy! Rated 5 out of 5 by SUSANASON_367431156 from My dog likes this product much better than the one I used to give him before. Thank you very much for the sample. I find it very helpful that I can try some products before I would buy them and discover new products. 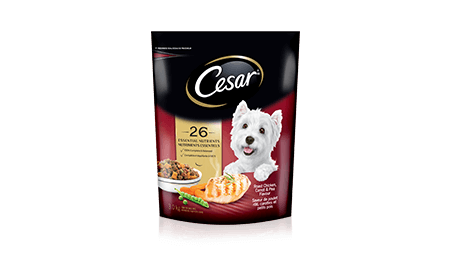 Rated 4 out of 5 by GERALDFNB_367393265 from All they ever eat for supper is the Cesar wet dog food in the small white containers. They are just very fussy with dry dog food. Cesar is definitely a good brand; however, this product just isn't one they like. Rated 5 out of 5 by BAILEYMON_367401439 from My pet absolutely loves anything little ceasers, doesn't matter if it's dry food or wet food. Usually give the dry food as a snack and the wet food daily. Love all the different flavours you can purchase as well. Rated 5 out of 5 by MONIQUEWQC_367415000 from My dog can not eat any kind of food since she has digesting problems so I was a little worried to try this one. She really loved it and didn't react to it! I will consider changing her dog food for Cesar! Rated 5 out of 5 by CAROLMON_367403996 from Meeka loved it. I usually buy Purina dry dog food because it's a little cheaper. I will probably buy this as a special treat and give it to her every couple of days.